Your hands open doors. They sign your name. They wear your wedding ring. They do a lot in your daily life, including showing the signs of aging. Over time, your hands can become withered and almost transparent exposing your veins. Your hands can appear rough and calloused and brown spots can form leaving you with the hands of, well, an old person. For baby boomers, the focus tends to be on the face. A little injection here, a lift there, but what about your hands? 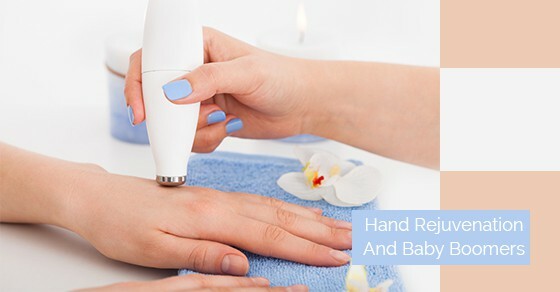 Besides your face, your hands can also benefit from a rejuvenation procedure. Look at your hands and if you notice loose, sagging skin, you are a good candidate for this renewal procedure. Furthermore, if you see prominent veins, tendons on the back and front of your hands, consider hand rejuvenation. Additionally, this procedure is great for hands that look bony or have developed moles or lesions over time. There are a number of methods used in the hand rejuvenation process. If you lack soft tissue fullness, it will be replaced. It’s normal to lose fat as we age, making our hands look more skeletal with our veins and tendons appearing to pop out of our skin. Soft tissue fillers and micro fat grafting techniques are used to restore your hands to a youthful state. For fat grafting, fat is harvested from other areas on your body such as your belly or thighs. The fat is then purified and injected into your hands through tiny puncture sites. Don’t worry, once healed, these puncture sites are invisible and your hands will look rejuvenated with a youthful appearance. It may take more than one session to achieve the desired look, but because the fat is taken from your own body, there is no chance of an allergic reaction. This hand rejuvenation procedure is called micro fat grafting because only a small amount of fat is needed to give your hands a youthful look. Fillers made of commercial soft tissue can also be used to achieve the same results as micro fat grafting. Commercial soft tissue fillers are safe and used on those who cannot spare the excess fat from the other parts of their body. Think of hand rejuvenation as renovations, the same you would do for your home. After many years, your property needs little tweaks and upgrades. The porch starts to sag. Your deck needs staining. The windows need painting. These remodels and renovations add value and curb-appeal to your home. Why not do the same for your hands? Contact the experts at Dr. Pirani’s office to see how we can help restore the look of your hands today!